Now that you have a gaming mouse, it is essential that you have a corresponding mousepad, preferably one, or more than one, with a fantastic design that suits your personality, is based on your favorite game(s), and is of good quality manufacture. As a basic background on the mousepad, a mousepad serves as a surface for the placement and movement of a computer mouse. Whether you still have a mouse with a ball or have a more recent mouse designed with optical tracking, the mousepad allows both of these technologies to accurately measure movement of the mouse, thereby increasing its functionality/usability. The claim to fame for the SteelSeries Qck mousepads is the combination of high quality cloth material, a textured surface, a non-slip rubber base, a larger than average surface area, and high quality gaming artwork. As such, the ‘high quality’ cloth material upon which the mousepad is based has been subsequently textured in a way which promotes accurate and consistent tracking of the mouse, whether it be optical or laser. I have found that the mousepad does in fact allow for this function with no apparent hiccups in tracking and/or responsiveness. This holds true regardless of the mouse’s location on the mousepad. Furthermore, concerning the smooth and accurate tracking of the mouse across the entirety of the mousepad, this SteelSeries Qck mousepad boasts a significantly increased surface area, 12 1/2” long by 10 1/2” wide, versus that of the average mousepad of 8” to 10” long by 7” to 8” wide, wherein you can use the mouse across a larger area without having to pick it up, such as in those cases where the mouse is falling off the edge of the mousepad, and move it back to a more accessible location on the mousepad. Concerning the constant movement of the mouse back and forth across the mousepad, as it often occurs when playing games such as DOTA 2 or Diablo III, the non-slip rubber base prevents the mousepad from moving due to hand pressure and/or mouse movement. Finally, what is most likely the best quality about these mousepads is the gaming artwork printed onto the surface of the mousepad. 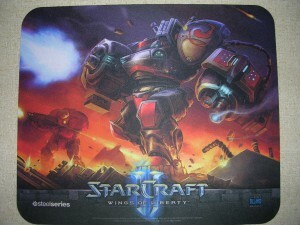 Over the last year, SteelSeries has released mousepads featuring artwork from DOTA 2, Diablo III, Starcraft II: Wings of Liberty, and Starcraft II: Heart of the Swarm, to name a few. There are very popular mousepads for Starcraft II, such as one featuring Kerrigan and Zeratul, and another piece from World of Warcraft, featuring a Worgen. As an alternative to purchasing a pre-designed mousepad, I also recommend designing your own. 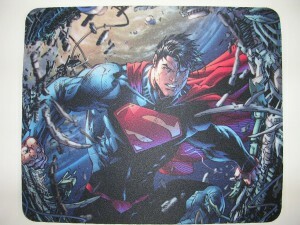 Personally, I have, so far, designed two mousepads through ArtsCow at www.artscow.com. Upon signing up for an account on ArtsCow’s website, and at random intervals throughout the year and/or during special events, you will receive credit for the creation of custom mousepads which are otherwise a $5.99 value. As a note, these deals may or may not include free shipping, although the $4.99 for shipping is more than worth the price of a decent quality mousepad with your own custom picture on the surface. Of course, if you’re paying attention to the deals, ArtsCow does occasionally offer a fantastic $1 deal which covers both the mousepad and shipping (which I haven’t caught yet unfortunately). Although you cannot manipulate the size of the actual mousepad produced, you do have control over the image used for the mousepad’s surface. Therefore, you want to ensure that the picture you are using has both a high resolution with high dots per inch (DPI). Foremost, the picture used needs to be large enough to fit the entirety of the mousepad area provided on the custom design page. The area provided is designed to represent the final product, which measures 9 1/4” long by 7 3/4” wide. Furthermore, you need to fit the picture within the dashed area, which is so marked in order to indicate potential areas of the picture which may be cut away/off after the printing process is completed. This is done to ensure that the important aspects of the picture are not removed during the printing/cutting process. As such, you want the primary parts of your uploaded picture to fit inside the dashed area with some non-consequential parts (e.g. background colors, designs, textures) falling outside the dashed area, just in case they do not cut off certain parts. Dots per inch (DPI): The number of pixels per each inch of the printed image. Inches: The physical size of the image, calculated from the resolution & DPI. As these three parameters are related, you can calculate any of the three as long as you have the other two parameters. For example, if you have an image which is 1,000 pixels high by 1,000 pixels long, with a DPI of 100, then the created image will be exactly 10” by 10” (Resolution / DPI = Inches). Therefore, as it concerns the mousepad size of 9 1/4” long by 7 3/4” wide, with a recommended DPI of 100, you want a picture with a resolution of roughly 925 pixels long by 775 pixels wide, or greater. Now, I haven’t been experimenting with the website for too long, but I have been able to successfully create picture folders, add images, load one or more images onto the template, and use basic functions such as zoom, add text, and format text. Once you are satisfied with your design, you can then name and save the design to your account. These designs can be accessed for either further editing or purchased from the ‘Saved Designs’ location under your account. After purchase, you can expect to wait about a week for the processing of the order and roughly two to three more weeks for delivery. Since this is not a high quality monitor with next day shipping nor a live animal purchase, this wait does not seem to be unwarranted for a custom designed mousepad manufactured in and shipped from Hong Kong, China, especially considering you are only paying the basic $4.99 shipping and handling fee. My first design is based on custom DOTA 2 artwork for the fan favorite Drow Ranger. 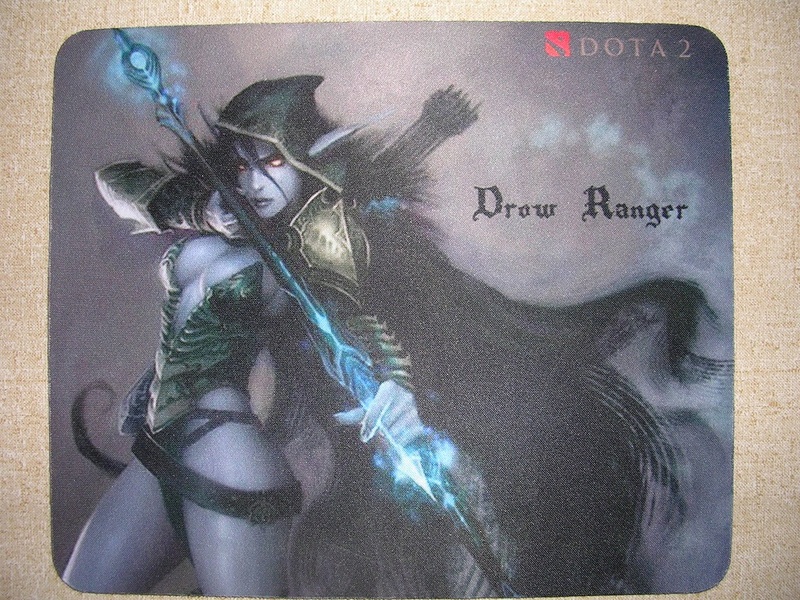 As you can see in the above picture, I overlaid the DOTA 2 logo, which had a transparent background, on top of the original Drow Ranger image. I also wrote out Drow Ranger using Rapscallion font and formatted it for size. As this was my first attempt with the website, you can see that some of the top of the bow did indeed get cut out of the final mousepad image, as this part fell outside of the dashed area as indicated on the website. I had planned for this possibility, so I want to again make sure that you are aware that any part of the image falling outside of the dashed area is not safe from removal. Regardless of the learning curve, I think this picture turned out quite well with no diminished quality between the original image and the mousepad. ArtsCow produced the mousepad exactly as they promised/described. 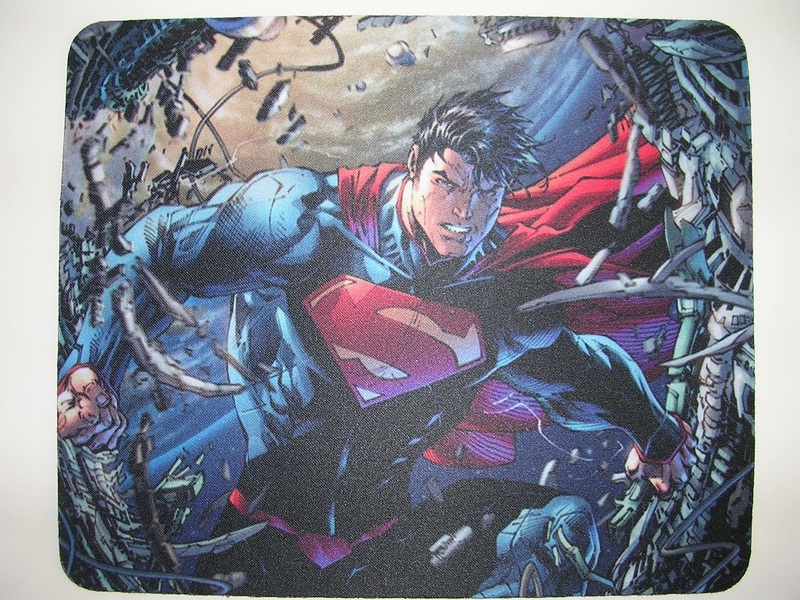 My second design is based on the graphic novel artwork for Superman from The New 52. In this case, I utilized a file which was 3600 pixels long (high) by 2700 pixels wide with 150 DPI. This offered quite a bit of leeway with the manipulation of the photo on ArtsCow. Of course, this is barring the fact that I turned a vertically oriented picture into a horizontally oriented mousepad. Regardless, the final product turned out quite well, with all the essential components printed and retained after final cuts. My third and fourth designs are based on artwork for some of the best Disney movies, both past and present, to be produced. The third design, featuring Flynn and Rapunzel from Tangled, is obviously not from the movie itself, but serves to showcase a perfect moment between the two with Flynn climbing up Rapunzel’s hair to be with her. Based on the tower in the background and the area upon which Rapunzel is standing, perhaps this represents a moment after Rapunzel has been reconnected with her true parents and everyone is living happily ever after in the castle. The fourth design, taken from The Beauty and the Beast, showcases one of the most beautiful scenes from that greatest of love stories.